With the exception of one schooling foray at the Horse Park on the 11th and a half-hour ride on the 21st, Wizard and I rode on the trails only for all our rides this month. It’s just too nice to not be out in the park. Most of our trail rides were 1-2 hours, mostly walking, with some occasional trotting and cantering. We’ve been riding both solo and with friends, and Wizard feels great. He’s confident and forward. At the very end of the session, I felt Wizard start to lose his patience. We ended the lesson with some 20m circles, just as he was tensing up and thinking of making an unplanned exit from the arena. I was happy with our good note, and was able to ride him out of the arenas and all the way across the cross country course without any episodes. And I was smart, too: I took him on a trail ride AFTER schooling at the Horse Park so he does not think he gets to go home right after riding at the Horse Park. Within 5 minutes of the trail ride, he was loose and relaxed and feeling good. 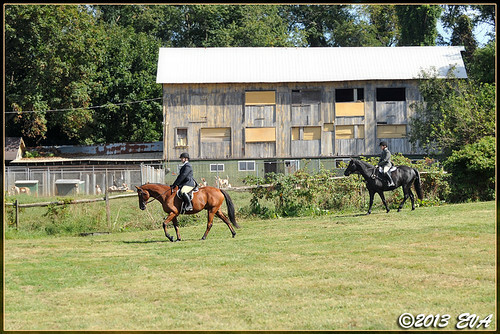 On the 15th, Christie and I teamed up to compete in a hunter pace hosted by the Monmouth County Hunt. It was my first hunter pace since the late 1990s during my glory days with Alibar. 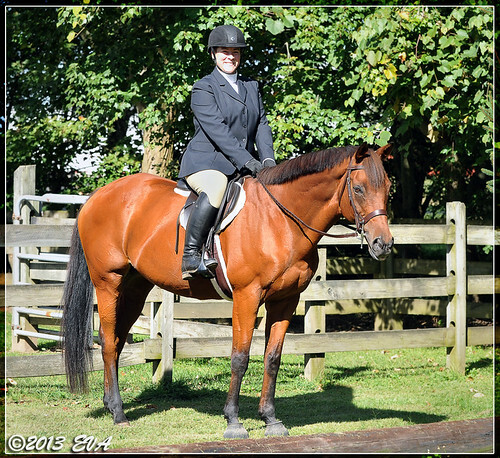 It was Brigid and Wizard’s first-ever hunter pace, and both performed very well. So well, in fact, that we won our division (Open) and overall Reserve Champion for the day! The ride was (roughly) 7 or so miles long. On the way out, Wizard was next to perfect. He handled the Hunt Club (including hounds in kennels and some tents, etc) very well. We hit a few snags when we started the loop back toward home and he got a little nutty at the canter, but it wasn’t anything that was scary or unmanageable. 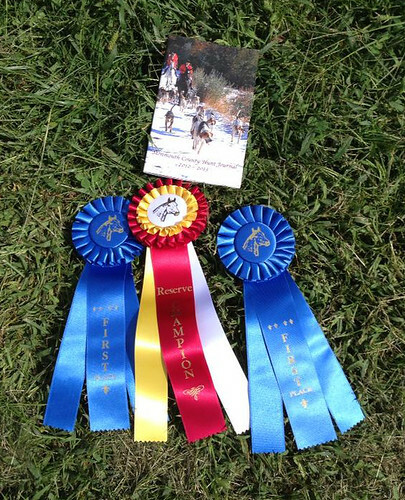 I was so proud of both our horses- we had so much fun with them. 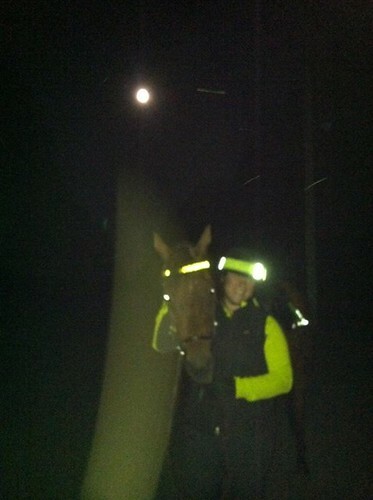 On the 18th, there was a spectacular full moon on a crisp night- Kris and Sunny joined Wizard and me for a moonlit ride. The moon was brighter than I expected, and we rode a full circuit around our usual local fields. On the 19th, the saddle fitter came out and adjusted the flocking on Wizard’s saddle. She said the left side felt lumpier/more squashed than the right side, and she felt it was partially my riding and partially Wizard’s inherent crookedness. After she added flocking, the saddle felt more stable again- no more shifting. After our appointment, my friend Erin and her mare Esme met up with us (she lives in MD) and we went on a great trail ride. 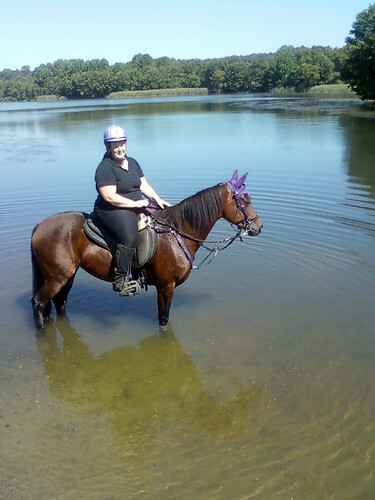 We rode the loop around the lake, followed by a second loop around the back field and into the Horse Park. Wizard was fantastic, only getting a little loopy when we cantered and he got a tiny bit jiggy at the very end of the ride. I rode him about 10.6 miles, which is longer than our usual rides, but he felt like he could have gone around again. He’s putting on weight and getting fit. So that’s been our September so far!